In an attempt to at least look like I'm organised, I really wanted to find the perfect planner for 2018. I've been hugely inspired by the beautiful bullet journal designs Full Flourish shares, and I was on the search for something not too big, not too plain, and with lots of room for sassing it up with my own scribbles. It came to me from Paperchase via a CarnLIVal goody bag, and I was so excited to crack it open and start planning it out. 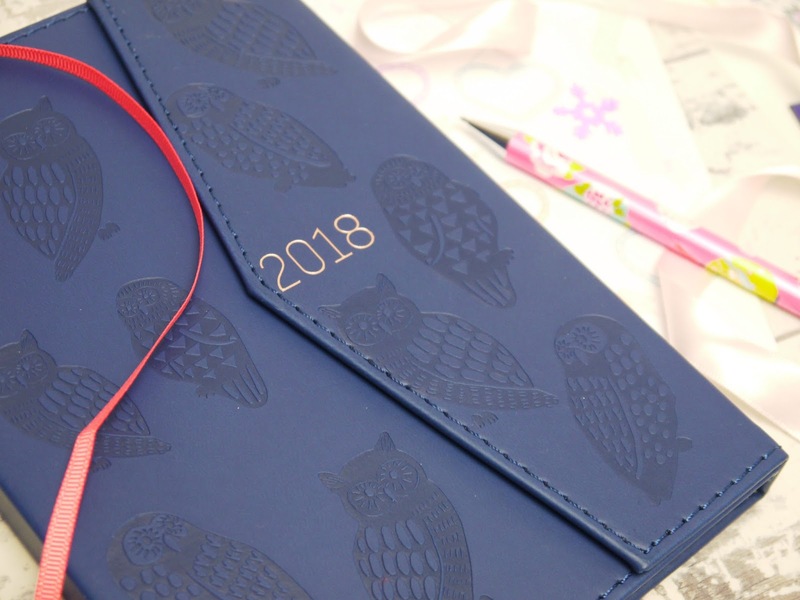 While I'm not a big fan of owls, I do like the navy colour, coral ribbon, rose gold debossing, and the sturdy wrap cover that will protect it in my bag. Since I'm not a busy bee, the week on two pages design is plenty of room. I plan to use them to jot down everything blog related, whether that's reminders to reply to comments, ideas for posts, or deadlines for reviews. With that in mind, I put a stats checker at the first of every month, not necessarily to put pressure on myself but just to chart my growth and see how well each month goes or where I could improve. 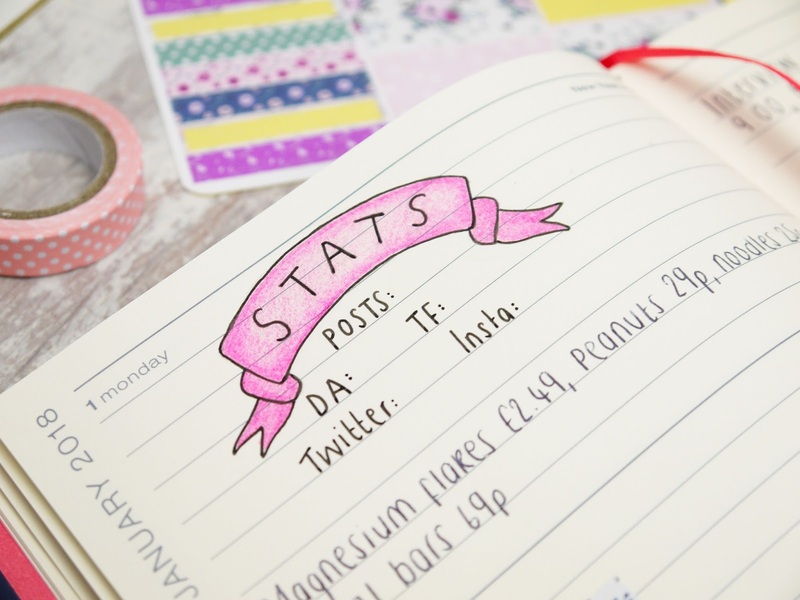 Your diary doesn't just have to be about reminding you of serious stuff, it can actually be a great way to encourage mindfulness, positive thinking, and help your mental health a little. 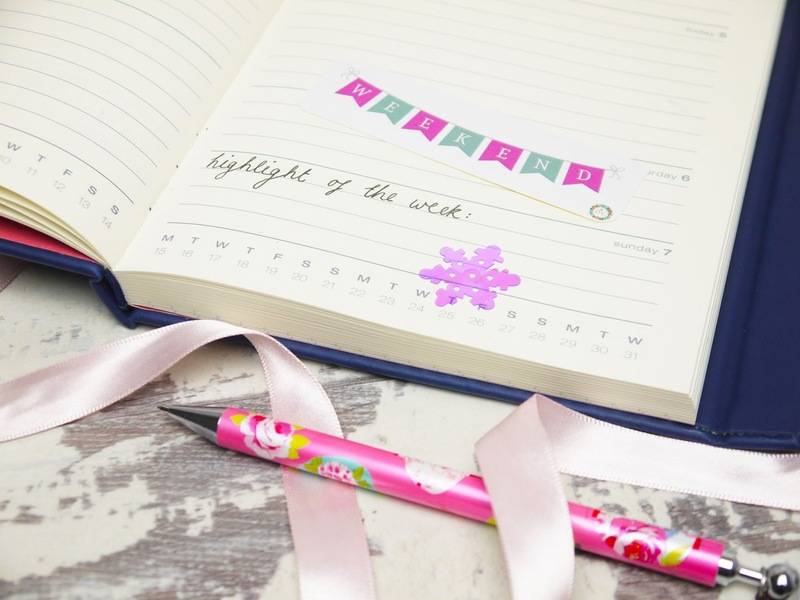 If looking at your diary fills you with dread when you see nothing but appointments and meetings, make sure to physically schedule in some time for you, too. These self care stickers are a really cute way to do it. I always bang on about the importance of loving the little things, so I practised what I preach and included a positivity prompt every Sunday. The idea is to reflect on the week that has passed, prepare my mind for the week ahead, and to be actively aware of the good things going on. The prompts include phrases like 'a random act of kindness', 'I'm proud of' 'something that made me laugh', 'extra grateful for' and 'how I helped'. While my blog and mental health benefit from my planner, I also find that noting down all expenses is helpful to my bank account. I'm pretty good at saving, and being able to clearly see where every pound and penny has gone is one of my secrets. If that doesn't suit you, I'd recommend using your diary to clearly mark out when your bills are going, and put in notes a week from any big sums, such as payday or holiday deposits. Regularly seeing the reminders keeps it in your mind and should help you to know when to spend or save. Lastly, this diary contains notes pages and squared paper. I've no doubt that at some point they will become canvas to bored scribbles and doodles, but I've started them off in the right way by jotting down some 2018 goals. 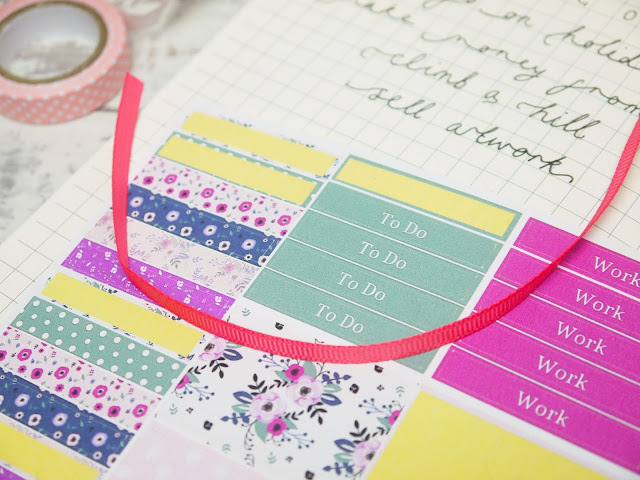 You could do weekly or monthly goals, to-do lists, write down encouraging and motivational words, or even stick in pictures and quotes to make a mood board. If you carry your diary with you, you then have portable inspiration! I'm looking forward to seeing how this diary looks at the end of the year, when it's full of colour and comments, and will serve as a mini scrapbook. Is there anything else you would add in?